Whilst Ballymore does not saddle up a runner in Saturday’s Caulfield Cup, we are looking forward to contesting three of the black type support races with three nice horses – Famechon, Octavia and Garud. The first of that trio – the VRC Derby bound Famechon – contests the fourth event, the Group 3 Norman Robinson Stakes and we are hoping to win it as a tribute to his managing part owner Andrew Ramsden who passed away this week. A great supporter of Ballymore since Michael and Paul first arrived in Melbourne, Ramsden was part-owner of our Melbourne Cup champ Brew. One race he always wanted to win was the Derby and hopefully we can fulfil that wish for him next month. Shaping very nicely this time in, Famechon was an exceptionally tough third in the Listed Super Impose Stakes at Flemington two weekes ago – sitting wide from an outside gate but finishing on doggedly. Due to jump from barrier three for Dwayne Dunn, Famechon has pleased the stable with his progress since his that run. Bonny mare Octavia lines up in the following race, the Listed Alinghi Stakes and she has freshened up nicely since her latest outing. A mare who saves her best for Caulfield, Octavia has won three races at the track including the Group 3 Cockram Stakes and the Listed Kevin Hayes Stakes. Meanwhile Craig Williams rides our final runner of the day – Garud in the Group 3 David Jones (Coongy) Cup. Right in the thick of it at both runs this preparation, Garud has however done a few things wrong and we have employed a couple of gear changes – a one-eyed blinker and ear muffs – in order to help him relax a bit better. 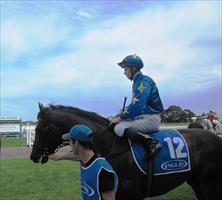 Glove Man in the opening event, a 1600m maiden. A game second over 1400m when resuming at Ballarat earlier in the month, Glove Man has pleased us since. Kicking off his campaign in the ratings 1200m event, Barbuda is having his first run since mid-May. Whilst he was tried over a bit longer last time in, the Al Samer four-year-old boasts solid sprinting form and has trialled well recently. Our final runner on a busy weekend is Air Striker in the 1600m Showcase and he has been good at both of his outings this campaign.